Alright y’all, sorry for the blogging hiatus but here we are with the next installment of the Perform series! 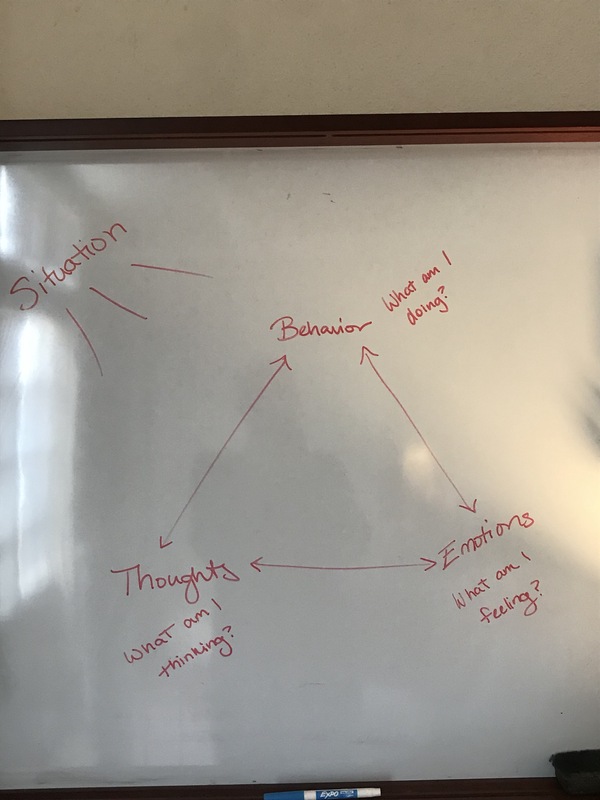 *cue fanatical cheering* So I’m going to do my best right now to make a relatively dry topic one that is more relatable and understandable: the Cognitive Behavioral Triangle. The triangle, as we shall now call it, is a way of conceptualizing our lives so we can address how to change patterns we typically fall into. Let’s start with the basics and then I will explain how it applies to an example. The triangle consists of (duh) three things: thoughts, emotions, and behavior. The cool thing is that we are able to change each of these by influencing other sides of the triangle- notice that the arrows in the picture go both directions. Don’t like how you’re feeling? Just work on altering your thoughts. Not a fan of your thoughts? Change your behavior. If we can begin to have more control and influence, the greater chance we have of mitigating issues when they arise. The first step is beginning to notice the triangle and how it plays into our everyday lives. This is a made up example a supervisor once gave me to demonstrate. Let’s say I’m a teenager again and I’m running late to lunch at school. I walk into the full cafeteria and immediately everyone begins to laugh (this is the situation I’m unable to control). My first reaction? I’m probably going to be startled (emotion) and stop dead in my tracks (behavior), I may begin to think “I wonder what they’re laughing at”. From there, I may think “oh god, what if they’re laughing at me? !” and I begin to get a little nervous or anxious. I breathe harder, I start thinking about how awful this is and feeling panic. The emotion becomes overwhelming and I run away, out of the cafeteria, and eat my lunch in the bathroom. It’s a pretty extreme example, but it’s easy to see where I could mess with my triangle to make it go a little differently. Here’s what I could do: as I begin to get nervous and think they’re laughing at me, I could combat my thoughts with “maybe it was just bad timing, maybe someone told a joke”. If I change my internal dialogue I’m still feeling scared but there’s a chance the intensity and overwhelming nature of the fear could be lowered. Let’s say I proceed to think to myself “alright, they could be laughing at me but I should ask someone to make sure I’m not missing something” then I look around to find one of my friends and decide to inquire with them. At this point I’m still feeling startled/anxious but I am able to push that down a little with my self-talk, my friend then tells me the class clown had just told some impressive joke. After hearing that I feel some relief, although I remain a little on edge. At all points in our day this triangle is firing rapidly, in most cases we aren’t even able to tell which part of the triangle came first, many times we don’t even realize it’s happening until our emotions are running amok and out of control. The first step to changing this cycle to make our everyday lives and our performances more enhanced is to become, you guessed it, aware. Today’s blog post challenge to you is to figure out how your triangle has escalated in the near past. I want you to write each step out: what you thought, felt, and did. Taking performance into account, maybe look at a time you may have botched something up or gotten uncontrollably nervous. I will share mine in the next post and we will begin to dissect how to change the various pieces now for better control in the future.